In the kitchen, as with any room in your home, lighting matters. 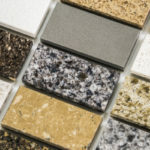 For your kitchen, there are all sorts of options available to match your style and décor. The most recent trend in kitchen design allows you to blend lighting types to create effective lighting in your kitchen, creating, not only, an efficient workspace, but also a welcoming entertainment area. After all, we all know the best times with friends and family happen in the kitchen! It is the place where cookies are baked with the kids, secrets are shared with your partner, and wine is flowing with friends and family. The lighting in the kitchen of today should be layered and blended, not the single light fixture format of the past. In all honesty that single fixture didn’t really work well in the past, even when the kitchen was only used for food preparation. 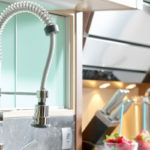 Those sole single lights of yesteryear are no longer the answer in kitchens that serve as food preparation areas, homework stations, dining spaces, and family gathering regions. 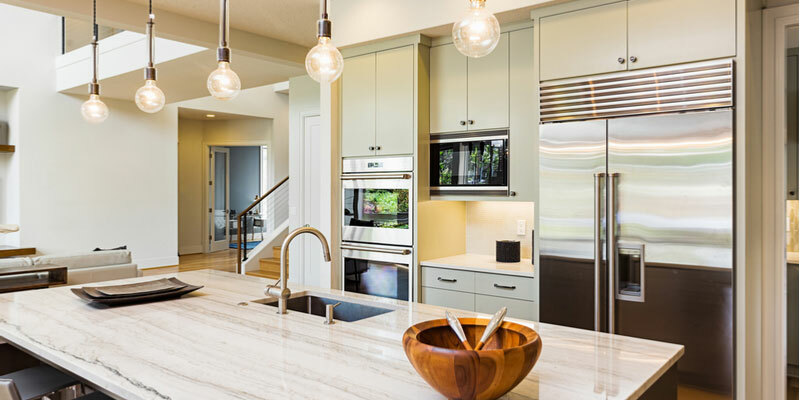 Your kitchen needs a combination of task lighting in strategic locations, with undercabinet lighting and other forms of ambient lighting as well as accent and decorative lighting. As the name implies, task lighting is the system of lights used to successfully prepare the meals and snacks for family and friends. Lighting should be placed strategically, underneath upper cabinets, over the island, and in the pantry. Essentially, task lighting goes anywhere you go during food preparation – from reading recipes to labels, from chopping to slicing to cooking. Keep in mind when planning for task lighting that it is not placed where it can cast shadows on your working area. 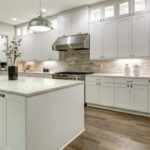 While under-cabinet lighting is an asset as task lighting, it also serves a dual purpose as ambient lighting with the help of a dimmer switch, after the food is prepared. Under-cabinet lighting comes in many forms – puck lights (halogen hockey-puck shaped lights), strings of lights, strip lights, and long linear bulbs. Ambient lighting alone, is often missed in kitchen design, but this indirect lighting is the part of kitchen design that creates the warmth and invitation into the room. Ambient lighting softens shadows, and guides easy flow from room to room in today’s open floor plans. From living room to dining room to the kitchen, ambient lighting leads the way, welcoming guests to the appetizers and drinks that await. Ambient lighting can include pendant lighting, track lighting, or flush mounted ceiling lighting. Accent lighting is the newest member of the kitchen lighting medley, as the kitchen becomes extended entertaining space. Accent lighting may be found highlighting artwork, a tile backsplash, or inside cabinets. Accent lighting comes in many forms – track lighting, up-lights, wall sconces, and directional eyeball lights. Decorative lighting is often the costliest of kitchen lighting. Decorative lighting needs to match the scale of your space, which often means the larger the space, the greater the cost. 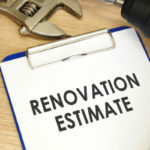 Decorative lighting can include hanging pendants, eye-catching artistic lights, and chandeliers and as such, require junction/recessed box in the ceiling. Now, pulling your kitchen lighting together simply affords you a variety of lights for food preparation and entertaining. Dimmers and switches allow you to change the mood from food preparation to family dinner to dinner party. Keep in mind, you want to ensure your lights are wired to different dimmers and switches to give you more options and adjustability in your lighting and design.